Officer Cody Barry and Officer James Belleville. Chief Darrin Moody named Officer Krista Harper as Reserve Officer of the Year, and Officer Ciara Paulsen as Officer of the Year. 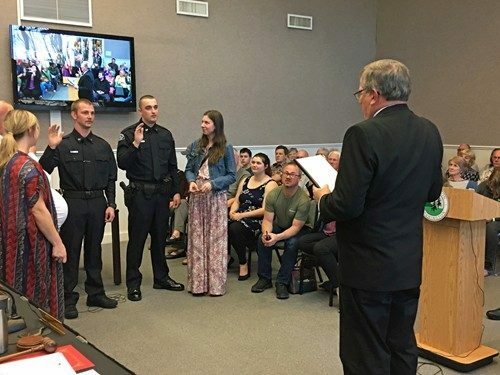 Cody was hired as a reserve police officer in May 2018. Cody originally applied for an entry-level position but was not selected. He decided to move to Shelton from Bellingham to attend the Reserve Officer Academy, because Shelton is where he wanted to work. He left his job and home to start the Reserve Academy. He quickly rose to the top of his class, and was always dependable and ready to volunteer. It became clear early on that Cody was the type of Officer the department was looking for. Midway through the Reserve Academy, the Department offered him a full time job upon graduation from the Reserve Academy. After his completion of the Reserve Academy, he went on to graduate from the Police Academy in Burien. Cody started as a full time officer with the Shelton PD last month. James started as Reserve Officer and graduated from the Reserve Academy in 2015. He was later hired as the Animal Control/Code Enforcement Officer for the Shelton PD in June of 2017. James continued to volunteer as Reserve Police Officer while working his full time position. He was always available to help with other “duties as assigned” and worked to kick-start the City’s code enforcement program. He received several commendations as the Code Enforcement Officer during his two year tenure. He was hired as a full time police officer last month and will be attending the Academy after he completes initial Field Training. contagious, and has yet to be seen without a smile on her face. The Department is lucky to have her.